One of the best moments for me in this trip is stepping in Busan. Maybe because it's my first time here, everything's all too unfamiliar and new and exciting. Or maybe the sun and the beach were the warm welcome that I needed after days of freezing in Jeju's winter wonderland, or that Busan's chill vibe reminds me of my home in Alabang (a city, but not quite). Whatever it is, I am making sure that this short encounter will not be my last. I've always wanted to visit Busan. I finally saw the chance when I booked another South Korea trip last winter. It felt like a long time ago, but it's just early this month! So my plan for this trip is to explore more of SoKor outside of Seoul, and of course on top of my list is to finally visit this city made famous by a zombie movie, hehe. Busan is known for being a port city, famous for its beautiful beaches including Haeundae and Gwangalli. If you've watched Nam Joo Hyuk and Jisoo's Celebrity Bromance episodes, most of the places they went to are either by the beach or restos that serve seafoods! So here's what went down and some tips that I learned from my trip to Busan! I left Jeju quietly, before the break of dawn. How dramatic is that! I went out of my room that served me well for four nights, wrote SALAMAT! in my guesthouse's white board, and rolled my three-wheel broken luggage out in the almost empty streets of Seogwipo. Unexpectedly, it was not as cold as my first day there, and navigating my way to the bus stop was way easier. And unlike day 1's winter wonderland snowstorm, ice has already melted, and even when I was out in the usually colder time of the day, I wasn't freezing that morning. So I took the airport limousine (bus) that goes straight from Seogwipo to the airport in about 1.5 hours. I think I just paid around 5,500 KRW (or Php 137.50). You can pay the driver with cash or just swipe your T-Card. True to the time given to me, my bus arrived at the stop on the dot. It was effortless, I don't even have to think about my luggage. I also arrived at the airport on time, and was able to easily check in. Since it's a domestic flight, allot around 40 minutes to an hour from your flight to check in. If you're not a morning person, consider all the travel time and check-in allowance before booking that first flight out! It was a quick flight, Jeju to Busan is only about an hour! If you're coming from Seoul, another way to reach Busan is by train (if you want that Train To Busan experience hehe). When I searched for train tickets online via Korail, a First Class Adult Ticket costs KRW 83,700 (or Php 2,092), or KRW 59,800 (or Php 1,495) for the Economy. Meanwhile, my airfare from Jeju to Busan via JejuAir is just KRW 34,200 or Php 855! If you book a Seoul to Busan flight, I checked the app now and it's even lower at KRW 32,900 or Php 822.50 +taxes. The downside of taking a plane is the baggage limit (15 Kilos only for a winter trip!) and lots of waiting time, but I took this one because of the schedule and because it is relatively cheaper. They also have a ferry and train option from Jeju to Busan, but did not looked into that anymore. If you're coming from Manila and want to go directly to Busan, FYI that Cebu Pacific already stopped their direct flights. I think PAL still has direct flights from Manila to Busan. I managed to buy this coin ticket from the subway ticket machines, this one is heading to the main train line in Busan where I made my transfer. Download a Busan train app to guide you, I use the "Busan Metro" with a blue icon. After Jeju's nature vibes, Busan is like mini Seoul with all the buildings and with trains as their main mode of transportation. I loved it right away! I used to book in Airbnb, but in my recent travels my debit VISA card is only accepted in Agoda so most if not all of my accommodations are already from that site. I managed to find a guesthouse that I easily fell in love with. First SUPER CHEAP. Second, it's BY THE BEACH. 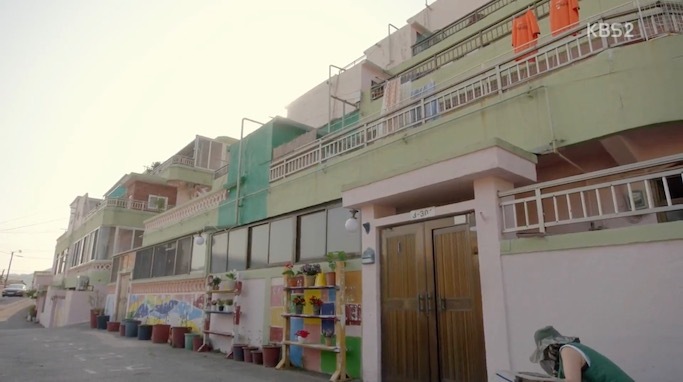 The name of the place is MoonDong's Hostel and it is located just across Busan's Haeundae Beach. I arrived a bit early from their 4pm check-in schedule. Unlike hotels in Manila that has early check-in, they don't even have a receptionist when I arrived at around 11am. I wandered freely at the receiving area, and fell in love with their common room. MoonDong's Hostel is located on the 6th floor of the Hotel Sky Beach. I got a bit lost looking for any signage of MoonDong's Hostel from the outside, but didn't see a single one! Just look for this building instead, the entrance is right next to a Tom N Tom's coffee shop and the BMW building. Again, it was empty when I got there so I took the chance to take photos while contemplating on my next move. Sobrang artsy dito, but best part is the view of the beach! Sharing the photos of my room aka "Bed in 6-Bed Female Dormitory". A night here costs only Php 575! I sent this selfie to my mom on my first night, haha! That's my bed, it has its mini table for my essentials (lip balm, water bottle), right next to the power outlet for charging my gadgets. Ganyan ako mag halughog ng things ko in this guesthouse, it is pretty spacious so I can just open my bag to look for clothes and other stuff. I also left it like that whenever I just go to the restroom because it is pretty much safe here even when I have 3 or 4 roomies. But whenever I go out, I just close and lock it, then roll it in the pinaka corner near my bed. Here's how a shower cubicle looks like in MoonDong's -- very neat, separate ang shower and the dry area where I can hang my stuff and change into my clothes. They also provide huge bottles of shampoo and body wash so no need to bring them. I also take pleasure in trying these Korean bath products, hehe! I slept well every night, even when the room is 3/4s filled walang invasion of privacy with these thick curtains. Sometimes, I love the hostel life! Also, you can see the tiny hook at the far end of my bed where there's a hanger for my coat and where I also hang my ear muffs. Distance to the subway is fair enough, nice stroll where you will see lines of restos and shops. Easier without your luggage, of course. Bus stop for airport limo is also walking distance, around 15 minute walk that you can easily navigate with your Google Maps (just search for "Airport Limousine Bus Stop"). There are nearby convenience stores, and food is never a problem. They also provide hair dryer and even hair straightener (a whole powder room for the ladies), towels, clean sheets, doors conveniently use pass codes and not keycards, and on my last night they even have movie viewing and gaming in the common room. Will go back here if ever I find myself again in Busan. You can check more photos of MoonDong's Hostel and book it on this page. My favorite part of this trip is living right next to the beach! Just across MoonDong's Hostel is the Haeundae beach. Just literally cross the street and you're there! Ito palang super happy nako. I can stay here for hours, and enjoy people or waves watching. Majority of the people by the shore were locals. No swimming that day because it's still too cold, but hey, compared to Jeju, it was sunny and warmer I can stay outdoors without my gloves, ear muffs, and face mask on! Kids enjoy feeding the seagulls, and often scare themselves when the birds were too near! Saw a Christmas installation right in the middle of the beachside. It has colorful lanterns with writings in Korean--maybe wishes for the new year? At the center of the wide street leading to the nearest subway (Haeundae Station) is this installation that looks even prettier at night! How To Go Around Busan? My main mode of transportation while in Busan is their subway. There are tourist spots that require additional bus ride, but I did not avail this for this trip since I only have one and a half day to waste. I bought their one day unlimited train pass (small paper lang sha so be careful with it) for KRW 5000 or Php 125. Super sulit nito sakin as I jumped from one station to the next, and I don't mind getting lost since the train card is unli. Btw, I was able to take pala 2 bus rides, one is after Gamcheon heading to the nearest station, and another one in a place I will never know off after getting lost and just have to go back to a nearby train station--haha! Both times I just paid with either cash or my T-Card. In short, trains are my comfort zone, whenever I see a train station feel ko hindi nako lost hehe. Welcome to this Instagram-famous pastels village! One of my favorite stops while in Busan is the Gamcheon Culture Village. You will think it's just a place to take pictures of the rainbow houses, but spend a little more time here for the food, for the art, and of course, for the sunset. Nung una it was refreshing to walk since it's my first day in Busan and it was not that cold, but later on I realized SUPER HABA NG LAKARIN! You can either take this 20-30 minutes walk, or just look for a cab or the bus stop. I am not sure what bus you should take though, but tanong galore lang kayo. Cab fare for sure okay na since it's near if by car naman lalo if group kayo. Hiking talaga yung walk from the subway so I won't recommend it, haha! But I was able to find my way through Google Maps. You will see an arch plus this sign painted on the ground and just walk on... Annyeong Gamcheon Culture Village! "....people care about one another and live together in close proximity and intimacy." I think the relationship of the people of Gamcheon with their neighbors is very similar with what we have here in the Philippines. We treat each other as if we're family. I just love reading info about a place para may lalim naman yung visit and hindi photo photo lang, hehe. 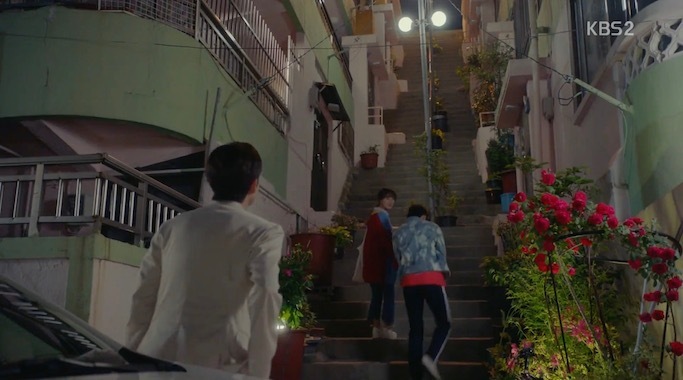 The houses in Gamcheon are arranged in staircase fashion so as not to block the view of the houses behind them, thus getting the nicknames "Machu Picchu of Busan" and "Santorini of Korea". They say that Gamcheon was formerly a mountainside slum saved by art when students restored the area in 2009 with colorful paints and adding wall murals. If this is true, then I hope my homeland will take inspiration from this! With no plans, I just Googled the top things to do while in Gamcheon and found out that I should try their Sweet Rice and Sesame Seed Korean Pancake. It's so warm and good, thank you internet! Ahhh my first good view of the village! Took my sweet time in this area just to take photos and even selfies. Even locals took millions of their selfies while they were there, it's not embarrassing at all to be vain when you're in Korea! 😂 If I have a selfie stick with me, I am sure gamit na gamit sya! Is that the Busan Tower? The wall art is a given, the view of the colorful houses is a given, but seeing EVERY SHOP here in Gamcheon looking like works of art themselves, grabe I have no words! And it turned out to be the photo op area of The Little Prince and the Fox!!! I would have wanted to line up for my turn, but I don't have anyone to take my photo huhu. ....And it was so beautiful! As I've captioned on Instagram, "When my coffee tasted 100x better"! It's in the ambiance, guys! Satisfied, I walked back to the arch heading outside the village and saw a bus waiting for more passengers. I hopped in and asked the driver if it's passing by a train station and it will! (Same station I went off - Toseong Station). Baka ito din yung same bus you have to look for to get here. With a bit of time to spare, I went down Geumryeonsan Station Exit 1 or 3 for a view of the Gwangandaegyo Bridge, a popular spot in Busan that you can enjoy even at night. I think I also saw this in Celebrity Bromance though I am not super sure if it's the same one (yung naka higa sila NJH and Jisoo sa boat). In here I think you can join a ferry cruise, or just lounge by the beach like most locals do. I did not go far na since I was so tired from all the walking that day, and just checked out the diamond bridge from the nearest view point before heading back to my hostel for a late check-in. I decide to not go in na since it's just an observatory with the city view. I just enjoyed this landmark from the outside. If you plan to check out the observatory, check out this package that comes with observatory ticket and a tour. Busan is also a shoppings site with its many outlets! I wasn't able to avail this though because the whole time I was thinking of my 15 kilo luggage allowance, but if ever you went there for branded finds at lower price, Busan has Lotte Premium Outlet, Busan Premium Outlet, and Shinsegae Premium Outlets. I only have one full day in Busan and around half the time I was lost and just wandering around! I usually get lost when I don't ask and rely on my instincts when it comes to bus stops HAHA. That's why I prefer to go to places that are just walkable from a train exit. Another fail during my Busan trip is scheduling my one full day on a MONDAY, which I forgot is the day when most Korean establishments were closed! Akk! So I dropped off Busan Museum of Modern Art Station--a subway station that I encountered just on that day while reviewing my train app. I was so curious, and after a quick online search I found out that it's a FREE museum so why not check it out nadin? Sadly, a big CLOSED sign welcomed me by the entrance! I am still posting this here if ever you want ideas for your Busan trip and you're there on a Tuesday HEHEHE. 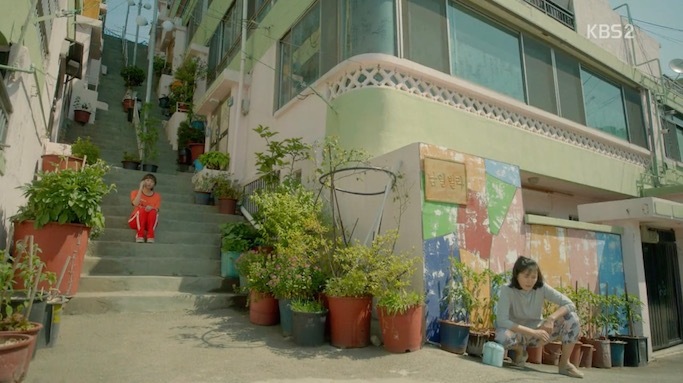 Bonus: Kdrama Location from Fight For My Way ~ Ae Ra and Dong Man's House! With all the fails that day--getting lost looking for bus stops and going to a museum that is closed for the day, I decided to just totally change my whole itinerary and go to a place where luck is always on my side ~ A Kdrama location! After researching, I was already on my way to check out the house of Ae-ra and Dong-Man from Fight For My Way! 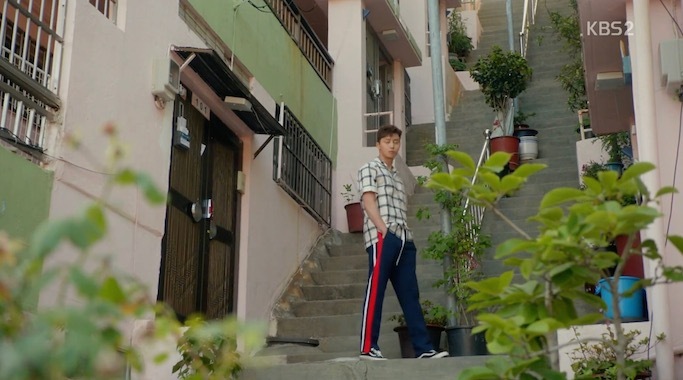 The location is called "Hansung Apartment Buildings" in real life, and it is not in Gamcheon Culture Village although the view looks the very similar. Also, I learned that the rooftop aka Namil Bar from the series is still around 30 minutes away from here! If you haven't noticed it yet, I tried to divert my most recent Korea trips into more Korea or season focused travels, and not so much na about visiting Kdrama locations. Although I still love my series and watch them every night when I can (currently finishing the recent drama Because This Is My First Life), I think I've already saturated my Kdrama Tour and now I want something else. 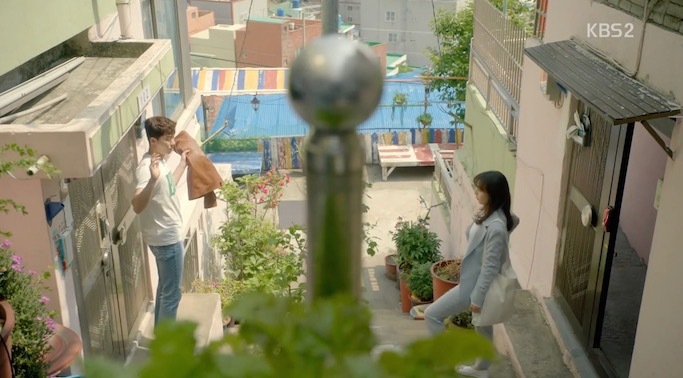 It's not giving me that kind of "rush" anymore, no more kilig that I first felt when I stepped in front of the Goblin's house or entered the house of my Kdrama girl Kim Bok Joo last Spring 2017. But when all else failed on my one and only full day in Busan, and I knew this day is already about to end, choosing to navigate the house in Fight For My Way brought back the enthusiasm and excitement in me. It felt like a treasure hunt or a mission that I should not fail, I just have to follow my map. Looking for the apartment was not easy, although by just looking at the map it looks near the train station. It's a hike or even a pilgrimage haha, I was afraid that the sun might set and I will still be in the middle of nowhere. You won't see so much people except those who live there, and I did not encounter a single tourist. Ang daming eskinita, hagdan, narrow roads that go up, and even gates of houses since it's a residential area. Mag kakamukha na silang lahat sa mata ko, haha! Tip: JUST GO UP! 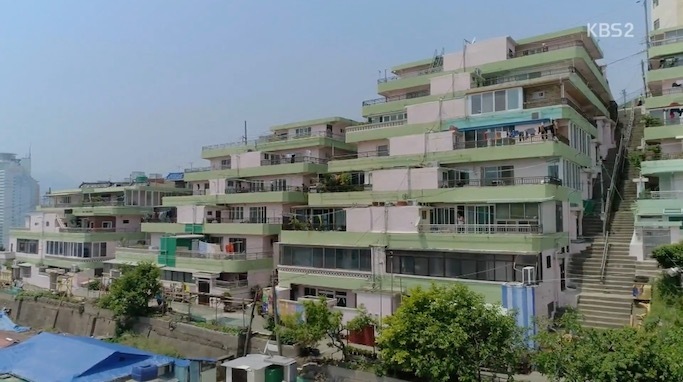 If ever you find yourself in Busan one day and don't know what to do, you may also want to visit Ae Ra and Dong Man's house. Just go to Jigegol Station Exit 2, and then follow this map with your phone: https://www.google.com/maps?daddr=35.136866,129.076102. 1) If you are also pressed with time like me and have few bucks to spare for your Busan trip, you might want to consider pre-booking tours and packages online so you can explore more and make the most out of your time. 2) You can also DIY! But expect to consume more time and energy, of course it is worth it anyway! Buy the one day train pass. They sell it in almost all stations via the ticket machines for only 5000 KRW. 3) During my DIY tour, I am almost always saved by being connected online 24/7. I use train apps and Google maps for navigation, and Google last minute tips like things to do or nearest train stations and exits. If you're a solo traveler like me, I suggest that you get a local Korean sim card. Connection is good, price is way cheaper, and you don't have to charge so much gadgets at the end of the day. 4) When in Busan, stay in Haeundae District. No regrets with this decision! I enjoyed heading out of my hostel with the beautiful view of the beach! 5) People are asking me if a day tour is possible for Busan, and I must say it is possible! Fly or take the first train from Seoul, then take the last one out. Just choose which of the sites you want to really see, most prob this will include Gamcheon Culture Village, Gukje Market, Busan Tower, a beach area (Haeundae or Gwangalli), and spend the night with the view of the Diamond Bridge before heading to your transpo back to Seoul. If you really want to see more, take the tours I linked above! 6) As for the budget, price in Busan is almost same if not relatively cheaper from Seoul. Siguro for the 1.5 days I only spent mga around Php 1500+, including all my meals and train cards. If included to and from flights plus my 2-night accommodation, more or less I just spent a total of Php 5000 in Busan. Heading back to my hostel, I decided to linger a bit more outside and then have my dinner (a Quiznos sandwich). I was walking near the beach area, when I heard fireworks and people running to the beachside to watch. It wasn't anything grand, ang bilis bilis pa nga niya, but it felt nice to ceremoniously say that it's my last night and so kamsahamnida Busan! Back in Manila, my family is already planning this year's out of country trip by October or November. We were actually set for Hanoi, when someone brought up Busan (I think it's my ate). It holds true even for this city, I am willing to go back one more time, or maybe if I am lucky, again and again and again. Watch my Day 6 Winter In Korea Instagram Stories: Hello Busan! Watch my Day 7 Winter In Korea Instagram Stories: Lost in Busan!